Our rates vary from room to room and by season. Your night stay includes high-speed wireless internet and a complimentary continental breakfast. Other breakfast items can be ordered from our menu. All rooms have a small refrigerator for your use. Nebo Lodge is the home of a bustling restaurant on the main floor and back deck (see our restaurant schedule below). Patrons usually leave by 11:00pm on evenings the restaurant and bar are open. Memorial Day Weekend: Open on Friday, Saturday and Sunday. Peak Season: June 26th to Labor day. Fall Season: Wednesday thru Sunday September 8th to October 7th. Plus the Mondays of Labor Day and Columbus Day. Off-season: Rooms are available in the off-season but food is not available. Please call or email for reservations. From June 26-Labor Day the Restaurant at Nebo Lodge serves supper on Tuesday through Saturday nights. On Mondays we offer an abbreviated menu to our inn guests only. Sunday guests may enjoy dinner at Calderwood Hall, a popular island restaurant serving local homemade pizza and salads, just a 5 minute walk away. Open weekends in the fall through October 6th. North Haven is a beautiful place to explore by bike. Our hybrid bikes, rented first come, first served are $20/day. Cots are available for select rooms. There will be an additional fee of $30, or $15 for children 5 years old or younger. If you would like us to prepare something special to be in your room when you arrive, or pack you a picnic lunch for a special afternoon picnic we are happy to help. We do require at least 48 hours advance notice for special requests, and certain things may require a little more time, but we will always do our best to make your stay with us as memorable as possible. For something as simple as a bottle of wine or champagne to be waiting for you when you check in, you can even let us know the day of your arrival. Just check out our wine list and call or email us at info@nebolodge.com with your selection. Our largest room with the most spectacular views overlooking the Thoroughfare and village below, this third floor suite has a queen size bed, private bath, a window seat and a writing desk. Its windows face east and south, capturing the sunrise and lots of sunshine throughout the day, as well as pleasant sea breezes. This room can accommodate a cot. 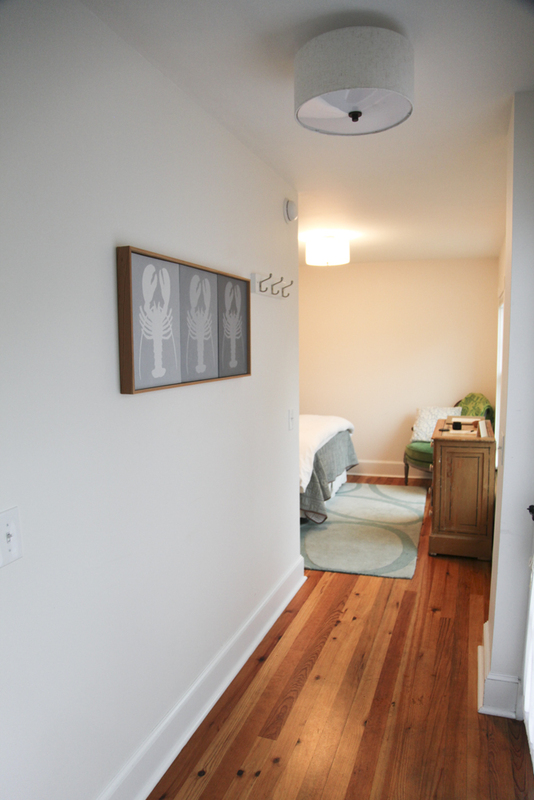 This beautiful newly renovated room features a private bath and a gas fireplace. It has a king-size bed, lots of room, a skylight, and some cozy seating. It is one of the nicest rooms at the inn. Dogfish is located above our bar, which closes at 11pm. This sun-filled room with a queen-size bed and private bath has windows that look down toward the water. It also has a cozy sitting area which can be removed and a cot added, if necessary. This sun-filled room has original wallpaper, classic antique furnishings, and a large bay window facing down toward the harbor. It has a comfortable queen-size bed and shares a bath with Babbidge, just down the hall. This is our only room where dogs are accepted. 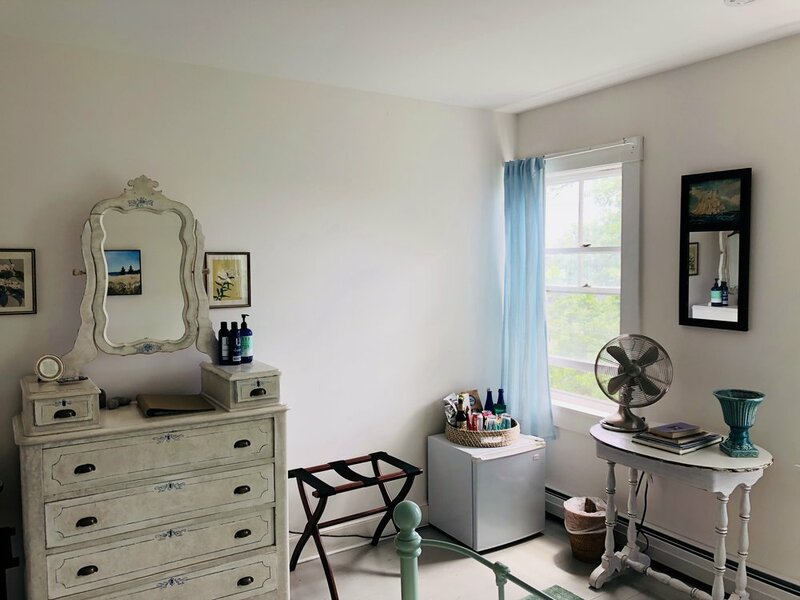 A cozy room with Angela Adams wallpaper and a queen-size bed facing the island community church, Babbidge shares a bath with Brimstone, just next door. This room is located over our kitchen which is usually closed by 10pm. 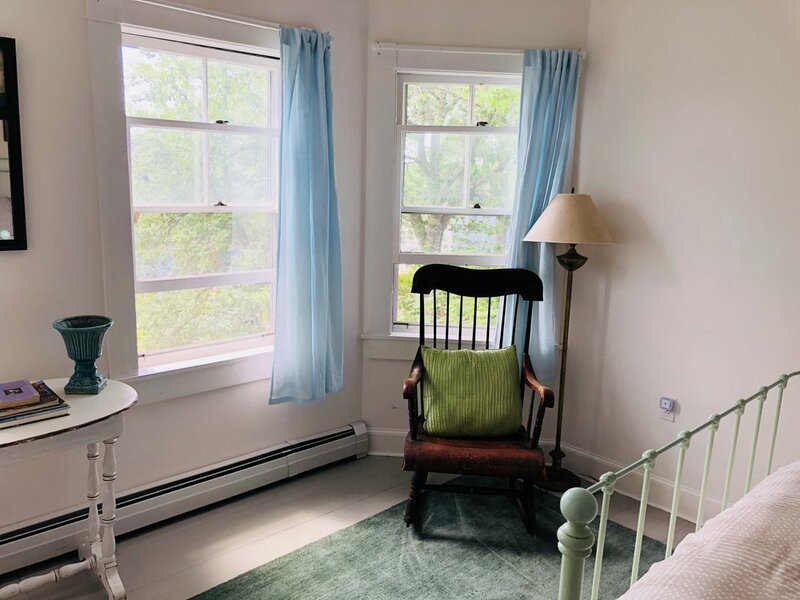 This bright and spacious corner room is on what was the “summer side” of the house, and features a queen-size bed, a writing desk and a view of the Thoroughfare. It shares a bath with Butter, located next door. 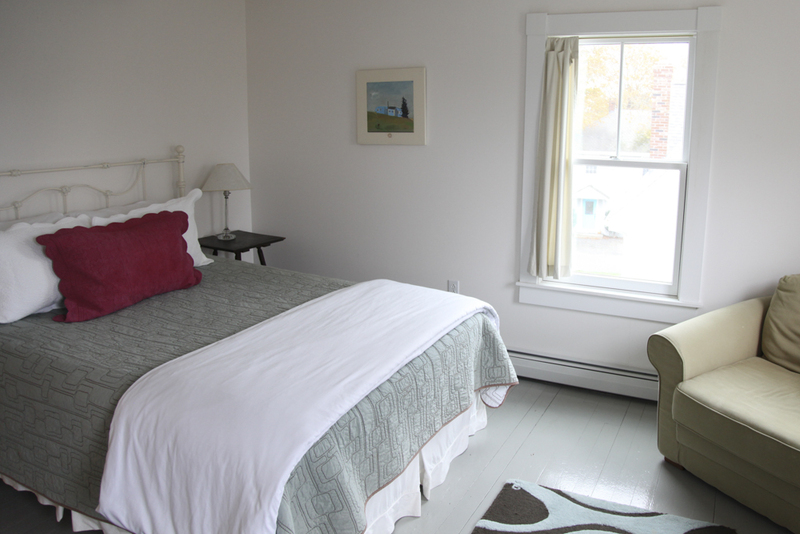 Butter is a bright, summery room with a queen size bed. It shares a bath with Eagle. Photos coming soon! We're renovating! One of two third-floor suites, with a private bath, a queen-size bed and a large window seat perfect for reading or taking an afternoon nap. The windows look east, catching the morning’s first rays and overlooking the thoroughfare in the distance. 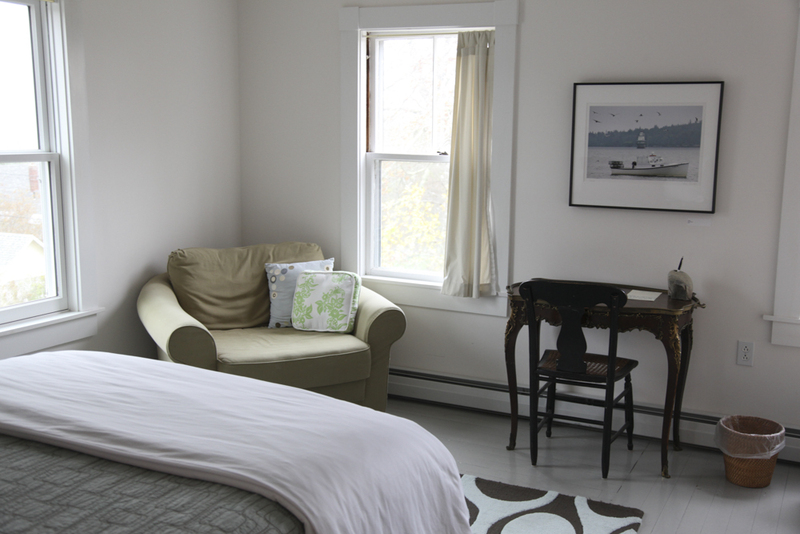 Located just behind the garden, Matinicus is a wheelchair-accessible, newly renovated room in a historic island home. 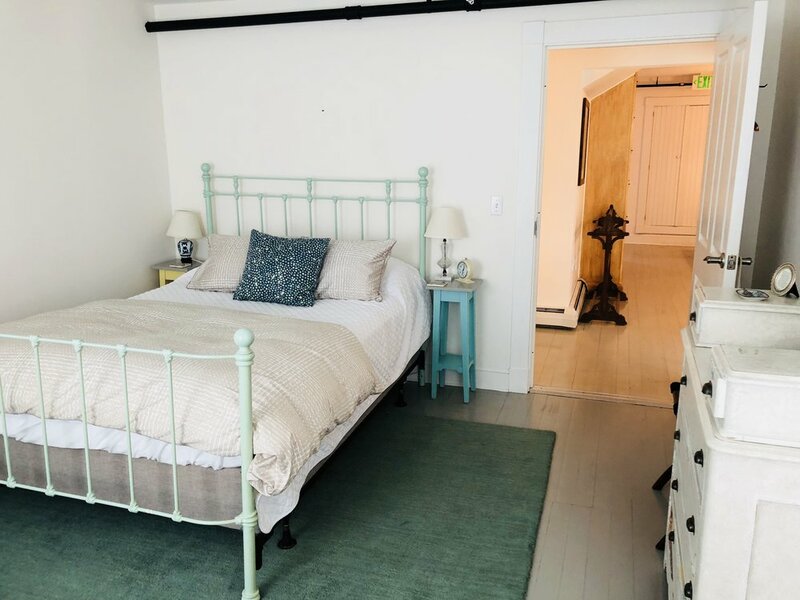 With a kitchenette, private bath, and small private deck, it offers a bit more privacy, but only a few steps from the porch of the inn and restaurant.